It felt so awesome to throw on this outfit, run outside with bare legs and take some pictures. The weather was mild, there was hardly a chill in the air. That comfort was very contrasting to today, it’s snowing again in Telluride and way too cold for baring much skin! I’m enjoying the transition from deep winter styles to my favorite spring fashions. I’m slowly packing up my winter gear. (But still leaving a bunch out for the indecisive weather.) I’m unwrapping a bunch of go-to favorites; denim skirts, plaid shirts, ankle booties and plenty of hats. Each season I carefully collect pieces that speak to me and none are throwaways. I look forward to revisiting them time and time again. I’ve picked out a bunch of great pieces for you based off my look here. A cute denim skirt with a plaid top is fun, flirty and can easily transition from work to happy hour drinks with friends. Let’s also keep festival season on the radar. This is a great way to dress for all those fun summer music festivals. With the summer sun, it’s best to keep your face protected from the sun and a wide brimmed hat is essential for that. Look for crushable hats that you can easily stowe away in a tote. I’m totally in love with these Golden Goose leopard booties. They are so comfortable and spice up any outfit. 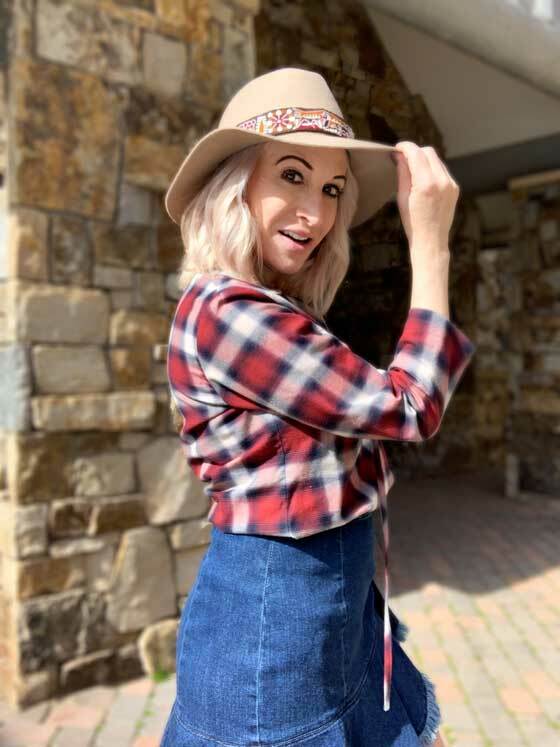 Hats are an important accessory not only because they look amazing and add so much character to any outfit…but they can also potentially help protect your skin from the sun if you go with a larger brim.